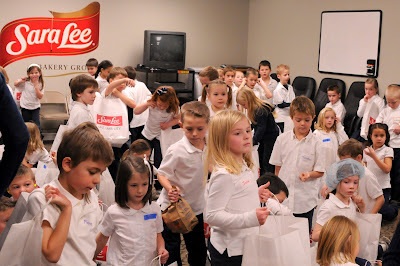 Jade's school class got to do a tour of the Sara Lee Bakery. 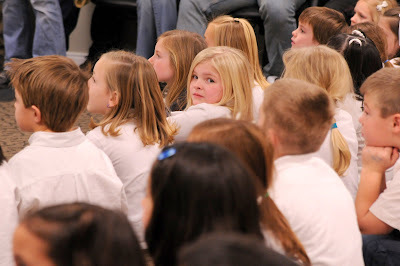 They don't typically do tours for a school group (but they do for small groups). The kids were all really well behaved and they had good questions for the team that was taking us on the tours. 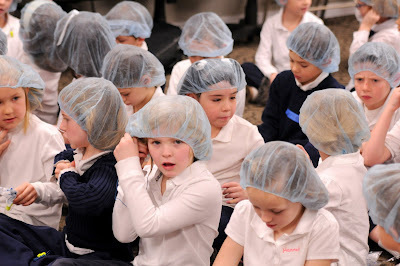 Everyone had to wear hair nets and earplugs. I didn't get any great pictures of the group with the blue hair nets but I tried. They were so darn cute with their uniforms and the hats. I think the pictures of the kids in the plant could have been some really fun promotional pictures for the plant, but they have a lot of really strict rules about photography. We took groups of 8 or 9 and we had two staff members and two parents for each group. I actually think the adults were more in awe by the whole thing than the kids were. I was blown away by conveyor system. It reminded me of the truck plant in Kentucky. Just everything flows and it is amazing when you see the start of the process and then all of the bread packed up ready to go, it's just amazing all that goes in to it. One of the machines pushed out 140 loaves of bread per MINUTE. The Grandma Sycamore bread machine only does about 30 per minute. The mixers are huge and can hold up to 2000 lbs of dough. The bread is moving constantly as it goes through the kneading and then the forming. Then it moves through the big steam and warming box to raise for 20 minutes. From there it goes into the oven, where it keeps moving through the oven for another 20 minutes. Once the bread is baked, it moves through the plant for an hour while it cools. Then once it is cool, it gets sliced and blown into bags. The kids got to try the dough from Grandma Sycamore bread, they had several pieces of the bread and buns through the process and then they were all given a loaf to take home. Plus Burger King donated kids meals to them all. One of the things that I thought was really neat was how hard the crust of the bread was when they put them in the bags. I actually liked them better with the hard crust, but they don't stay hard in the plastic bags. The kids had a blast and really learned a lot. Thanks, Sara Lee Bakery team for letting the first grade experience bread making in bulk. I think they will remember it for a long time. This looks so fun and I love the photos. It would be a great "cousins field trip" this summer!